Despite lacking the compelling narrative arc of Tell No One (Guillaume Canet, 2006) or the playful familiarity of Little White Lies (Guillaume Canet, 2010), the new Francois Cluzet vehicle is every bit as exhilarating as any Hollywood thriller worth its salt. 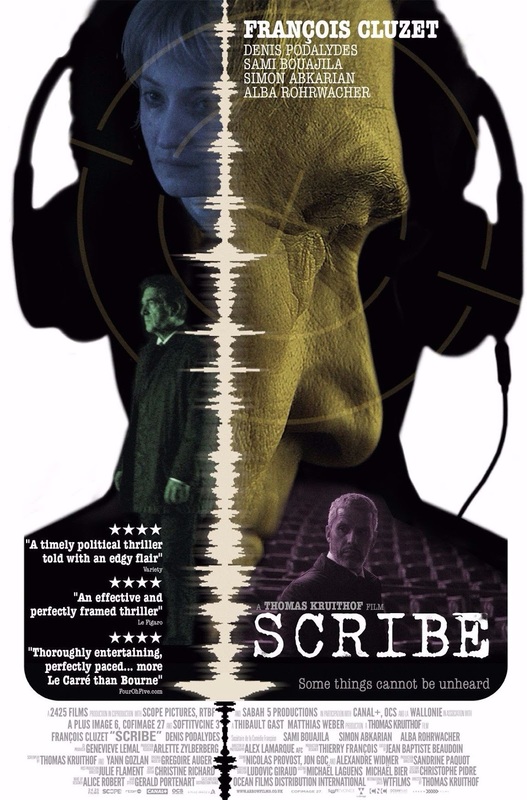 Directed by Thomas Kruithof from a script by Yann Gozlan, Scribe manages to surpass all expectations by offering its audience a genuinely gripping story of political intrigue and state secrets which will keep them guessing till the very end, all the while throwing in the odd red herring along the way. Duval (Cluzet) a lowly office worker and recovering alcoholic is not having too much luck finding a new job after a recent breakdown which cost him his last one. When one day a call comes from a shadowy figure named Clément (Denis Podalydès), Duval is made an offer he will find very hard to refuse. His instructions are to transcribe taped conversations which have been recorded secretly by an unknown organisation. All seems to be going smoothly and without too many questions asked, when one day a tape lands on his hands which contains what appears to be a political murder. Unable to reach Clement or anyone associated with the job at hand, our hero must carry on regardless despite fearing for his own life. Set amongst an election campaign which favours a corrupt presidential candidate, the film is not only brilliantly cast but is also skilfully written. With more twists and turns that you can shake a stick at, Scribe will ignite the interest of every conspiracy theorist going and will manage to bring to the forefront what many suspect a political campaign looks like from the inside. Taking a leaf out of some of the most outlandish House Of Cards narratives, the film manages to possess an indie sensibility all the while offering one of the most accessible storylines even if it sometimes resorts to too much intrigue at the expense of a more realist narrative arc. Whilst parallels can be drawn between Scribe and some of the best Grisham inspired conspiracy thrillers of the 1990s, the film is at its best when it isn’t trying too hard to emulate its predecessors. Duval is offered to us as someone who has never had any interest in politics, making him the prime candidate for the job. Despite the, at times, facile storyline, Scribe manages to keep its audience guessing till the very end without ever letting on about which way the story is going. On the whole, Scribe’s accessibility could result in it becoming one of the summer hits which no one saw coming. Cluzet is as magnificent as ever as the everyman caught up in extraordinary circumstances, as is Podalydès whose chilling delivery will stay wth you long after the film ends. A special mention must also go to the brilliant Sami Bouajila (Days of Glory, 2006) as police chief Labarthe who puts in one of the most believable performances of the film. A genuinely thrilling piece of filmmaking.